Morgan : what a load of cobblers. I found this on Annette Sykes website, and I was appalled. You've picked up the anti union/working class MSM line: I'm a working class woman, with ancestry you know nothing about, who has worked supporting low paid workers for many years and who has continued to do so in parliament. I'm no "high flyer" but do the hard yards and your comments are elitist and ignorant. You also need to understand MMP a little better. I was first elected as No. 43 on Labour's list and then 33 the following term. Stu was 28 and Kelvin 23 in 2011 - both great positions that recognised their potential and ability; but 27% of people gave us their party vote and we won four seats we didn't have at the last election. I'm annoyed at the shallowness of your analysis. I thought you might be better than this. Darien is Labour’s new junior whip (JW). Whips are responsible for caucus discipline. However, as evidenced in the above, she has not exercised discipline herself. It is a cardinal sin for an MP to engage a blogger. The MP adds legitimacy to the blogger and the bloggers’ claim. You cannot win a fight with a blogger. You can win the battle, in other words you can win the argument, but you lose the war. Trevor Mallard smashed Whaleoil in their cycle race, but Whale still won the war. Trevor was pulled down to Whale’s level and smashed in the mud fight. Darien, as JW, is unwise to go around engaging bloggers. She risks turning what was an irrelevant claim from a small time blogger, read myself, in to something serious. Imagine if this comment was left on Kiwiblog, or any other right blog for that matter. Darien would be crucified. Darien (as JW) should impose online discipline on Labour MPs. No commenting on blogs would be a good start. Also, don’t acknowledge bloggers. Now, I accept Darien’s right to take me to task. She has an even greater right given my unkind comments towards her. And hey, maybe I am elitist and ignorant. But isn't it just monumentally stupid though, to engage me? (This post is written on the assumption it actually was Darien Fenton who commented, not some online loser. I'm sure I'll be corrected if this wasn't Darien). It was. UPDATE: I may be elitist and ignorant, but cannot see for the life of me where I have picked up the "anti union/working class MSM line". Having said all of this, I accept my comment about Darien's ability was ungracious and uncalled for and I apologise. Sorry, we were filming Back Benches for next weekend, not tonight. The episode will screen next Wednesday. I'll be on Back Benches again tonight. The show will screen at 8pm (not 9pm like most weeks) and I'll join One New's Jessica Mutch, Vic pol scientist Ana Gilling and Jordan Williams from Vote for Change. Is it me or do they stack these panels with righties? Last time I was on I was the token lefty (David Farrar, Mark Unsworth and Ana were the other panelists) and it looks like I'm the token lefty again. I'll be on Waatea Radio today with Willie Jackson sometime after 11 and no later than 11.30pm. We'll be talking about the Maori Party I think. On a slightly unrelated note, this will be my last post until January. When I'm back I'll whack out my promised election post mortem and I'll update the best and worst performing Maori politicians page. Thanks for all your support this year. I really do appreciate it. Thanks especially to everyone that's commented and emailed me. You keep me on my toes and, at times, bring me back down to earth. Thank you. Despite taking a hit, the Maori Party has signed up for another three years with National. The two parties have signed a confidence and supply agreement as well as a new relationship accord. The agreement differs from the last in that the Maori Party can vote on an issue by issue basis (except on matters of confidence and supply, for example the budget). Obviously, this gives the Maori Party room to oppose asset sales. However, as much as the Maori Party would like to distance themselves from asset sales, and the government’s larger agenda for that matter, the party is still going to be tainted by association. The agreement includes the establishment of a ministerial committee on poverty, chaired by Bill English and deputy chaired by Tariana Turia. With English at the helm I doubt the government will dismiss the committee in the same way Act’s economic taskforce was ignored last term. The Maori Party needs to reclaim Maori poverty from Mana (Mana owned the issue last term) and bust the perception that they favour the symbolic over the substantive. Having said that, with the government committed to returning to surplus the next three budgets will probably be zero sum. 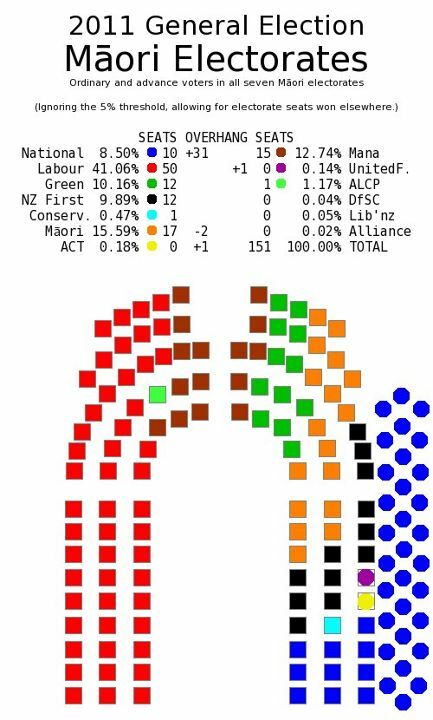 With that in mind the committee will just be a flash vehicle for reshuffled funding and, as a result, just another symbolic win for the Maori Party. The agreement also includes an undertaking to shift the focus of Te Puni Kokiri (TPK) towards jobs, education and housing. Again, an attempt at making substantive gains, however, again, the win is weak. It is difficult for many Maori, if not most, to connect changes in TPK to real world gains. I think this particular policy is more about protecting TPK. TPK was, I think, first in line for cuts this term. However, with an increased and broadened focus I doubt the government can cut staff and funding without crippling the agency and undermining the Maori Party. Then again, when has that ever stopped them. The big announcement is the retention and expansion of whanau ora – the Maori Party’s trophy policy. A stand alone commissioning agency, whatever the hell that is, will be established and funding for rheumatic fever will be doubled to $24m, 20,000 more low income homes will be insulated and work will progress on iwi providing social housing. The Maori Party’s re-election strategy revolved around whanau ora so no surprise to see the above. The rheumatic fever funding is, in my opinion, a huge win for the Maori Party. For example, in Tai Tokerau rheumatic fever was the dominant health issue and many voters were calling on their MP, Hone Harawira, to address the problem. Of course, Hone was and is in no position to do so – he actually had to point to work done when he was a member of the Maori Party thus undermining his decision to split from the party. The home insulation win is neither here nor there. Iwi providing social housing is not new, but with government backing we should see proliferation. Overall, a good deal for the Maori Party. The party is free to oppose the government on all issues except confidence and supply. This should, in theory, lead to a more independent image this term. In other words, it’ll be hard to accuse the Maori Party of being the National Party’s proxies in the Maori electorates. In terms of policy gains, I’d give the Maori Party 6/10. Nothing to set the world on fire, but nothing to complain about either. The challenge for the Maori Party will be to distance themselves from National’s agenda and destroy the perceptions created last term. For example, the perception (or reality some say) that the Maori Party sold Maori down the drain with the MCA Act, ETS, GST, ACC changes, the 90 day law and so on while only winning symbolic gains like the TRT flag over the harbour bridge. The symbol over substance argument. Charter schools: at best the evidence is mixed, at worst the evidence is an indictment against the idea. There is no compelling evidence in clear support of the idea – or at least I’m not aware of anyone who has produced or pointed to any compelling evidence. Over the past 48 hours a lot of has been written on charter schools, most of it rightly rubbishes the idea, but we haven’t seen anything from a Maori perspective. With that in mind, I’ll give an outline of the idea from a Maori perspective. On first principle, the charter schools idea is attractive. Allowing iwi to take control of education in their rohe (area) satisfies the very foundation of tino rangatiratanga – the right of Maori to control things Maori. Any idea that will advance tino rangatiratanga is certainly welcome. The idea also fits nicely with the partnership principle i.e. the government funds education while Maori deliver it. On a cynical level, the charter schools could, hypothetically speaking, mean profit. If the corporate arm of iwi, as opposed to say the social services arm, took responsibility for iwi charter schools then the motive would be profit. Controlling education would be another step in iwi’s desire for more control over New Zealand, especially in strategic areas. The iwi leaders are currently transfixed with delving into strategic resources and companies like geothermal power and Air New Zealand, but control over education is probably a far more potent area. Iwi could, hypothetically and cynically speaking of course, shape how their students see the world. On a brighter note, iwi would be attracted to the idea as a means of reviving Maori culture. If our charter model is anything like the overseas models iwi would have the power to set the curriculum. Iwi could include subjects like rongoa (broadly speaking Maori medicine) or set up traditional wananga. This probably ties in to the principle of active protection i.e. the government, in allowing iwi to set such a curriculum, is taking active steps to protect Maori culture. It’s a gamble though, allowing iwi anywhere near education. Iwi certainly have no experience in delivering education and I doubt there are many overseas models to draw on. Having said that, the kura kaupapa model is a good place to start. However, in my opinion kura kaupapa, although successful overall, are still suffering from teething problems. I don’t think it would be sensible for Iwi to deliver Maori language medium schools only too. Young Maori need to be prepared to enter the Pakeha world. This necessitates an element of mainstream education in whatever model iwi adopt. I tentatively support the idea of iwi having some power over Maori education. This doesn’t mean I support the charter school model. In fact, I strongly oppose charter schools. I think it’s unfair that the overwhelmingly Maori populations in South Auckland and Christchurch East, along with the non-Maori population too, be subject to a trial of what is, at worst, a failed model. Surely John Banks should use his people in Epsom as guinea pigs for his pet idea. When the trial fails, or is repealed as soon as Labour gets in, New Zealand is going to have a subset of failed young people. I don’t think Act and National can see that there is a connection between poor policy and results in real world. Anyway, as above the idea of iwi control over Maori education is decent and if the charter idea goes ahead I’d support iwi involvement. Former Labour MP John Tamihere has criticised David Cunliffe's choice of running mate for the party's leadership, saying he picked Nanaia Mahuta because she is female and Maori. Tamihere said Cunliffe's choice of deputy was ''smarmy'' and typical of him. Nanaia was the standout in the Native Affairs Kowhiri 11 debates. She defeated her opponents by a Waikato mile in the debates and was, in my opinion, the best communicator of all the Maori candidates who fronted in the different debates. Nanaia is, in my experience, fiercely intelligent too. I don’t know how JT missed that. He must never listen to her I guess. Jones was a better choice despite not having run a strong campaign in Tamaki Makaurau, Tamihere said. ''Out of the two of them you'd have to rate, on Labour Party values and on the street bringing the men's vote back and a whole bunch of other things, Shane all day long; if he can get over in his own mind the self mutilation that he conducted in that hotel room,'' Tamihere said. I think this comment gives a hint to where JT is coming from. It seems to me that a little bit of sexism is at play.Yes, Nanaia is a woman and Shane is a man. That doesn’t make Shane the superior candidate. JT has overstepped the mark. He didn’t need to launch an attack against Nanaia to prove his point. She’s a strong candidate. She deserves respect not this sort of marginalisation. The Maori Party are neither left nor right. Or so they say. The Maori Party, apparently, do things the Maori way. In light of this, what do we make of these claims? There could be a new face at the top of the Maori Party as early as next week. ONE News has been told Te Ururoa Flavell is poised to take over from Pita Sharples as co-leader. Flavell and Maori Party president Pem Bird flew into Wellington together today from Rotorua. Bird said the plan to make the Wairakei MP co-leader "is an open secret". "The issue is around when and how so," Bird said, but it is believed the idea is to have a new leader in place around the same time a deal is struck with National. "That would be the goal," Bird said. This is a leadership coup, no two ways about. But is a leadership coup the Maori way of doing things? Surely, after decades of service to Maori and more recently the Maori Party, Pita deserves to stand aside on his own terms? I don’t think Pita should have his mana trampled over in a brutal leadership coup. All power to Te Ururoa if he wants to stamp his mana, but some thought should be given to Pita’s dignity. The party owe him as much. There’s no question that Te Ururoa should assume a leadership position in time. Both Tariana and Pita have indicated their intention to call it quits in 2014 and Te Ururoa is the only remaining MP. He is, according to many, the Maori Party’s most capable MP as well. With a number of bills in the ballot box and one bill, the Gambling Harm Reduction bill, due to come before the House this term Te Ururoa was, legislatively speaking, the most active Maori Party MP (leaving aside the two Ministers Pita and Tariana). But is it wise to throw Te Ururoa in the mix now? I doubt it. In my opinion, it’s safer to have Te Ururoa take Tariana’s position when she steps down before the next election. A bloody coup will exacerbate the swing against the Maori Party in Tamaki Makaurau, opening the seat for all parties in 2014, and contribute to the perception that the Maori Party is a sinking ship. The Maori Party need unity, or at least a semblance of unity, too. Voters punish political parties for a lack of unity. Look no further than the Australian Labor Party, or even our own Labour Party. I don’t know what is driving Te Ururoa and his supporters. With age Pita is losing much of his intellectual ability, that much is clear, but is he a liability? Of all of the Maori Party MPs Pita was and is the most effective MP when it comes to reaching across the racial and political divide. I doubt Te Ururoa, and also Tariana for that matter, possess the same skills. This reminds me of the Hone Harawira expulsion drama. Te Ururoa and Pem Bird were leading the charge to eliminate Hone. They wanted Hone gone. There was no other option for them. The same is true here. Pita must go with no option two. With such an aggressive and uncompromising approach to politics one wonders whether Te Ururoa and Pem suit the Maori Party. The Maori Party is about careful compromise, but Te Ururoa and Pem don’t seem to know how to compromise. I wish them luck when they hopelessly deploy their bully boy tactics against National.